A new study has revealed that 83 per cent of Aussies don’t set aside time for daily relaxation, while almost two-thirds can’t sleep well – even on holidays. Apparently, we’re a nation of very sleepy, stressed out individuals. 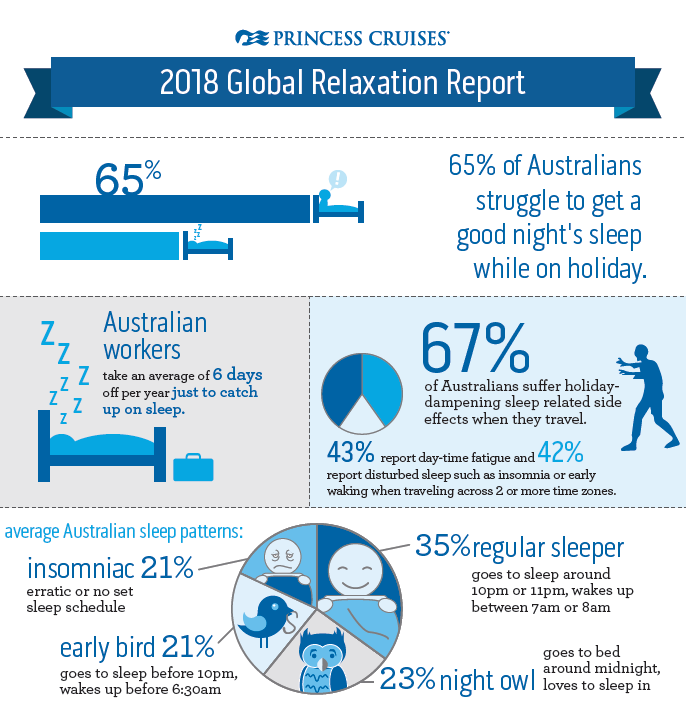 Princess Cruises’ 2018 Global Relaxation Report compares the sleep and relaxation habits of 12,000 people across 12 countries, with Australians ranking as the third most sleep deprived. Conducted by Wakefield Research for Princess Cruises, the independent study found 61 per cent of Australians surveyed suffer from lack of sleep, compared to only 48 per cent of respondents from Hong Kong and 34 per cent in Indonesia. Only respondents from the U.K. (63 per cent) and Singapore (62 per cent) scored higher than Australia for their poor sleep habits. According to the study, Australian workers are taking an average of six days off work per year just to catch up on sleep. Meanwhile 73 per cent of Australians surveyed said they used the weekends to catch up on sleep, compared to a massive 92 per cent in Vietnam and 90 per cent in China. Personally, we deal with our sleep deprivation issues with excessive amounts of coffee and midday naps at our desk. The study also found 65 per cent of Australians struggle to get a good night’s sleep on holidays, with 67 per cent of those surveyed reporting they experience “holiday-dampening” sleep-related side effects when they travel, including disturbed sleep, insomnia and early waking. World renowned, board-certified sleep expert Dr. Michael Breus said that the new study underlined that sleep continued to trouble people around the globe and across generations, whether at home or while travelling. “Sleep is a vital, sensory experience that allows our bodies to recharge and recover from mental and physical strains,” Breus said. “With so many Australians struggling to sleep well while on holiday, the best way to ensure you get the rest you need, no matter where in the world you are, is to try to maintain a sleep schedule and behaviours similar to ones kept at home. The study also found that 83 per cent of Australians fail to set time aside to unwind every day, unlike those surveyed in the U.S.A. where more than 20 per cent of respondents prioritised time to relax daily. “When looking at factors that impact sleep, stress management plays a huge role in keeping sleep at bay,” added Breus. Dr. Breus has partnered with Princess Cruises to design the Princess Luxury Bed and optimise Princess staterooms for a sleep-friendly sensory experience to ensure guests get the best night’s sleep while on holiday. Honestly, you had us at bed, Princess. Riviera's Thomas Morgan: "We're very committed to the trade"
Not all heroes wear capes, as this dramatic rescue of two passengers from a downed plane in the Caribbean demonstrates. We’re so excited by the prospect of being rewarded for sleeping that we’re going to take a midday nap at our desks to celebrate.